In a field as exciting and opportunity-abundant as technology, a job that’s mediocre, mundane or downright mechanical just won’t cut it anymore. But, there’s never really an easy way to say goodbye. Is there? With its new #QuitInStyle series, Hotstar, India’s leading premium streaming platform, comes to the rescue with out-of-the-box, innovative, yet brutally honest resignation letters. Taglined ‘Dare. 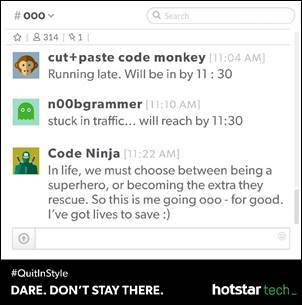 Don’t Stay There’, the campaign showcases unconventional ways to bid adieu to your existing jobs and join the incredible Hotstar tech team to build the future of online video for the world. Not all heroes wear capes. 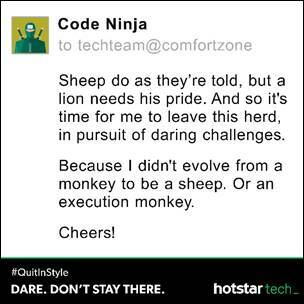 In an attempt to save the country, one disgruntled employee at a time, ‘Code Ninja’ dons a superhero persona and breaks free from the shackles of a routine workplace. Whether it’s through the countless work Whatsapp groups, e-mails, or in a blaze of glory, the campaign urges people to always #QuitInStyle. The creatives strike a chord with the crème de la crème of the tech fraternity and paint a vivid picture of the exhilarating opportunities that await people who join the company. Launched as India’s singular destination for live sports, and a wide collection of movies and shows in 9 languages, Hotstar has registered stupendous growth, skyrocketing from 100 mn to 350 mn downloads in the year 2017 alone. The company is inviting people who dare to be a part of the team that is venturing into territories no video streaming platform has dared to before.